In Julie's recent post Calling All Dragon Lovers, she talked about how creative author Brandon Mull is and how she struggles to be more creative in her own writing. I've been challenged to be more creative in a steampunk short story series I'm working on as well, so I thought it would be good to use this Writing Life post to talk about ways to be more creative. So here are some thoughts and suggestions on ramping up the creative juices and improving your stories. Reading a variety of genres is always good because it expands your range of abilities. Reading mysteries (and contemplating how a good mystery is told), allows you to build mystery and suspense into your fantasy, for instance. But it also introduces you to new ideas and settings. Don't just read teen or adult. Read middle grade fantasy. These authors are very creative and use all kinds of wild and silly ideas that adult books don't (the suspension of disbelief and tolerance of silliness is less, I think, in adults, so creativity is inherently greater in children's books). Don't just read fiction. Read non-fiction. My WIP, a steampunk series, was inspired partly by a book about longitude. Really? Yes. Dava Sobel's book Longitude about the development of the sea clock for the accurate determination of longitude at sea was fascinating (and involving personal stories, drama, sailors lost at sea, a race to win a grand prize, and more). The idea that people didn't have the technology to know where they were (at least at sea, where it's easy to miss that little island with the water you desperately need) until only a couple of hundred years ago blew my mind. And got me to wondering what a world without the ability to navigate would be like. Yes, the repetition was intentional. Don't just read new fiction. Read mythology and history. The ancient weren't short on wild and crazy ideas. And history can be almost as crazy as fantasy. I thought J.K. Rowling and Tolkien were extremely, unbelievably creative until I learned more about mythology and Old English literature and history. A lot of their ideas, I discovered, aren't brand spanking new; they are simply either new to me or repackaged in a way that makes them seem new. Middle-earth? It's an Old English keening (compound metaphor) used in Caedmon's Hymn and probably other works. The moon runes in the dwarf's map in The Hobbit? Anglo-Saxon futhorc. Not really new. And that's okay. A phoenix and basilisk? Not new either. "There's nothing new under the sun," so it's no shame to re-purpose old ideas and no discredit Tolkien and Rowling at all. Study other cultures. What's new and fascinating to one person may be everyday life or a familiar story to someone else. Boarding schools are rare in my corner of the world, so setting at story at a boarding school made Harry Potter unique even without magic (boarding school stories are no longer unique, so be careful). You never know what aspect of another culture might be useful directly or spur an idea that ups the creativity of your story. This really goes back to number one. How can I make this more creative? How can I make the receiving of mail a magical event? What if people couldn't navigate for themselves? If a faerie curse prevented navigation, how far could they go before getting lost? How I can put fear of spiders into my story in an unforgettable way? What if...? How could...? Is a bird delivering a message really new? No. Carrier pigeons, anyone? But using an owl as a post man to a boarding school is new. We've already said that a phoenix isn't new, but a phoenix in a headmaster's rooms is new (and unexpected), as is a phoenix (so far as I know) delivering a hat with a sword in it. Putting old things in a new setting, combining them, using them in new ways, altering them a bit (like Rowling altered the mythological basilisk) are ways to increase creativity, partly because it's unexpected. 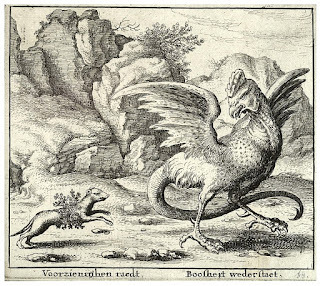 From wikipedia: "The basilisk and the weasel, in a print attributed to Wenceslas Hollar. 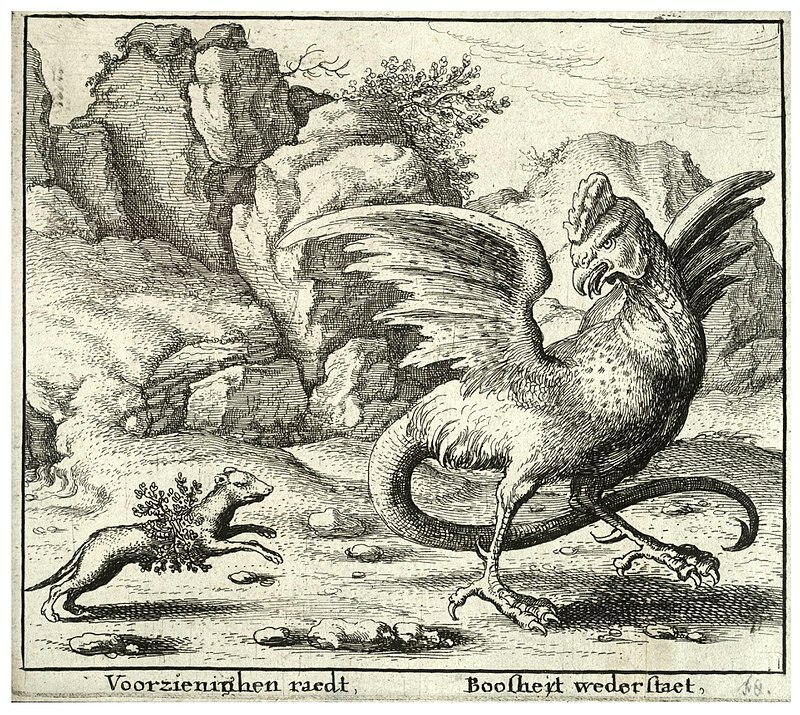 The cockatrice (pictured) became seen as synonymous with the basilisk when the "basiliscus" in Bartholomeus Anglicus' De proprietatibus rerum (ca 1260) was translated by John Trevisa as "cockatrice" (1397). A basilisk, however, is usually depicted without wings." So basilisks varied a good bit in mythology, and J.K. Rowling added her own version in the Harry Potter novels. An author friend (I won't give her name so as not to risk any spoilers) recently asked about how to get her main character information from a dead character. The tropes are to have the character find a letter from the dead character, have a seance, or have someone else tell the main character. I recommended she find something that fit her story world. J.K. Rowling used magical memory storage balls to get a character needed information. It fit her world and was really cool. If you write fantasy, then you have the option to come up with amazing things--and just knowing to ask the question, being willing to challenge yourself, will usually lead to the answer. So recognize tropes and keep seeking new solutions until you come up with a fresh idea. Remember you're writing in a fantasy world! This one is great for adding tension to the story as well. In The Rose and the Wand, I introduce a traveling ring. It lets Giles travel instantly wherever he likes (by the way, the idea actually came from a version of the original fairy tale--Beast gives it to Belle so she can go home to visit her family and return to him--and I tweaked it to fit my story). Marcel, in To Catch a Magic Thief, has the mate to Giles's ring. But allowing Marcel to go wherever he wants, whenever he wants is not good for story tension! He needs to be stuck in dangerous situations, and unable to easily rescue Gabriella, so I had to put limitations on the ring. It only carries one person and no luggage (he can't escape with Gabriella in tow); it won't take him anywhere if he doesn't know where he is; it won't take him to a place he's never been. Putting limitations on the ring not only makes it unique, but raises situations that challenge me. I have to find a new ways for Marcel to escape. That challenge, that question of "how will he escape?" will stimulate me to come up with a solution that isn't expected. I also give the ring another attribute, but it would be a spoiler to share it, but remember you can add other attribute to an object to make it unique. That's a lot of information! Thanks for hanging on to the end. In summary, read widely to fill your creative wellspring and remember to challenge yourself to be creative. Great article, Elizabeth! Thanks for the tips!